As I grew older, I began to notice that everything around me that I saw and felt was tainted with distrust, fear, or doubt. I wanted to find something that was undeniably pure and riddled with happiness or even hope. My search wasn’t extremely successful until I was the age of 12. At twelve years old, people began to tell me I was wise beyond my years and honestly I was, but getting there was not easy. It was in fact very painful. As a little 6-year old girl, my dad was always yelling at my mom. My mom would weep and I could do nothing, but hug her and listen to her earnestly imploring me to find a good Christian guy who would cherish, love, and adore me for everything I was. When I turned 10, I began to doubt true love or even love existed among the world. My theory was true for me especially when my parents fought through a nasty custody battle after the divorce. My wariness to love only grew until the day I met Hope. I was tagging along with Chris. Chris was a 13-year old guy who loved horses with all his heart and I was his best friend. We had known each other since I was 5 years old and he was 6. Chris had always been there with me, and for me. I knew his flaws and he knew mine and that only made us better friends. Chris was determined to find a horse that he could love and ride western with for the rest of his life. Chris was also determined to make me love horses as much as him, so one day after school he took me by the arm and dragged me all the way to a horse auction only a mile away. There was no way Chris could even think about affording a horse, but he always said it never hurt to dream. So there I was inside Chris's dream, watching him as he examined each and every horse. "Bekah, if I were to have a horse it would be that Arabian/Pinto Cross or that Quarter horse." Chris said pointing to the horses as he spoke. "No, if you were to have a horse it would have to be the Pinto/Arabian and you would name her Lily and she would serve you until death." "You can't possibly know that from just looking at her." Chris replied. "Sure you can! Look at her eyes, they have seen stuff. She’s been beaten. Her lip is permanently hanging down. You should know this," I bumped Chris with my shoulder, "but, she's happy and she still hopes to find a good western rider like yourself. She would do anything for you, kid." "That's what they all say, Chris." I answered laughing, but was completely serious even as I said this. I know that mare was pure with hope. That was the day, May 26, 2003, that I learned to see hope in the smallest things such as rocks, trees, and horse. 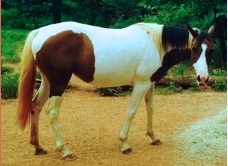 And because of a simple Pinto/Arabian Cross, I began to heal from the inside out. Maybe you could write a story with lots of action. I love action-packed stories!